We’ve had a lull in core samples over the past several days on the JR, so things have been pretty quiet for the science party. The ship’s technicians, however, have been working nearly round the clock to place casing and a re-entry cone in the last hole we drilled at Blue Moon, so that future expeditions can re-sample the hole and potentially drill even deeper. The down time for the rest of us hasn’t gone to waste–many of the scientists have caught up on data analysis and report writing, or potentially even more important, SLEEP! Many of us have also had the luxury to enjoy watching the serene sunrises every morning (or sunsets at night, depending on what shift we’re on), burn a few extra calories at the gym, watch a movie or two in the lounge, or put together frustratingly intricate 1,000 piece puzzles. 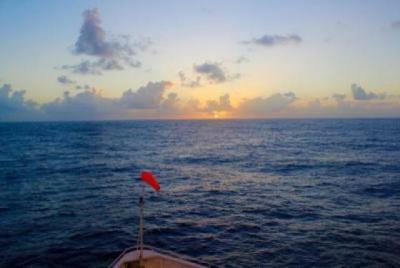 Watching the sunrise is a morning ritual for many of the scientists onboard. 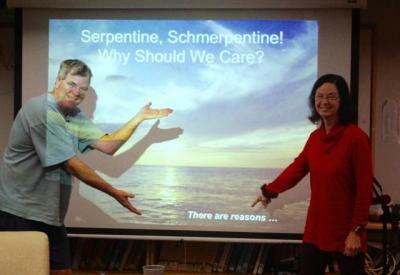 Why Should You Care about Serpentinite? There are Reasons. Our co-chiefs, Patty Fryer and Geoff Wheat–never ones to waste free time–took the opportunity this week to explain the objectives and significance of this expedition to some of the crew and technical staff. While the methods and background of our Expedition are quite technical (there are entire conversations I overhear between geologists onboard that, despite being in English, I can’t decipher even with my science background), Patty and Geoff do an excellent job of communicating the scientific goals of Expedition 366 and explaining why they are relevant to science and society at a broader level. Geoff and Patty try to convince the crew that they should care about serpentine muds. How do you make blue mud from deep beneath the sea floor relevant to your average land-dweller? If you are Patty Fryer, you appeal to their innate curiosity about the origins of life on Earth and their obsession with catastrophic natural disasters. Yes, Expedition 366 involves detailed measurements of the chemistry, microbiology, and physical properties of specific types of sediment and fluids from the Earth’s crust and mantle. But the underlying motivation of the scientists onboard is to learn more about the processes that have both led to our very existence, as well as those processes that threaten our existence, at least at smaller scales. Blue Mud: The Origin of Life on Earth? One of the theories being explored during this Expedition is whether life on Earth could have originated in serpentinized muds just like those we are pulling up in core samples along the Mariana forearc. This theory purports that the first living organisms may have arisen during a time when the Earth was experiencing a cool phase, when the oceans were around 100 times more acidic than at present. Serpentinized mud has a very high pH (meaning it is very basic), thus the first organisms could have possibly used the pH gradient between this mud and seawater as a source of energy. There is still only limited evidence for this “serpentinite origins theory”, which makes the research on Expedition 366 all the more significant. Our geologists, geochemists, and microbiologists are all examining the serpentinized mud samples in a unique way, and combined, their results may help clarify the importance of these sub-surface environments to the evolution of life. While we are still in the early days of the Expedition, the scientists are already finding interesting connections between microbes, chemical signatures, and mineral deposits in our first core samples. As analyses continue, a clearer story will emerge about the life cycle of both the abiotic and biotic components of the mud, and maybe even help clarify how life may have begun in these kinds of muds. Scientists in the core lab working hard to describe the minerals and related properties of samples from Blue Moon. The other major area of interest among the science party of Expedition 366 is seismic activity in subduction zones. We are following a path starting at the Mariana Trench, where the Pacific plate begins to slide under the Philippine plate, eastward away from the trench for several hundred kilometers, following the Pacific plate as it moves further and further below the surface. Needless to say, the tectonic activity in this region results in a high amount of seismic activity–meaning earthquakes, sometimes leading to devastating tsunamis. Our 3 seamount sites are situated at increasing distances from the subducting Pacific Plate (starting right, moving to the left). At each site, the Pacific plate is deeper below the seafloor, and is thus facing increasing temperatures and pressures. 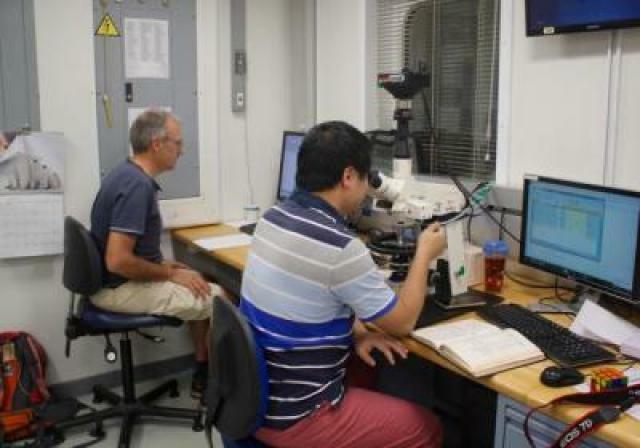 By studying sediment cores from mud volcanoes at increasing distances from the subduction zone, scientists can start to piece together a chronological history of seismic events, and how these events may influence geochemical cycles and microbial communities through time at increasing distances below the sea floor (and therefore at increasing temperatures and pressures). The cores provide a ‘window’ into the geological past, recording both short-term events like major earthquakes, and longer periods of relative stability or slow change. Eventually this fundamental knowledge can help improve our earthquake and tsunami modeling and predictive abilities, ultimately leading to more effective warning systems for at-risk regions. There are many more detailed questions being asked during this Expedition, and we will continue to explore them in future blogs and videos. 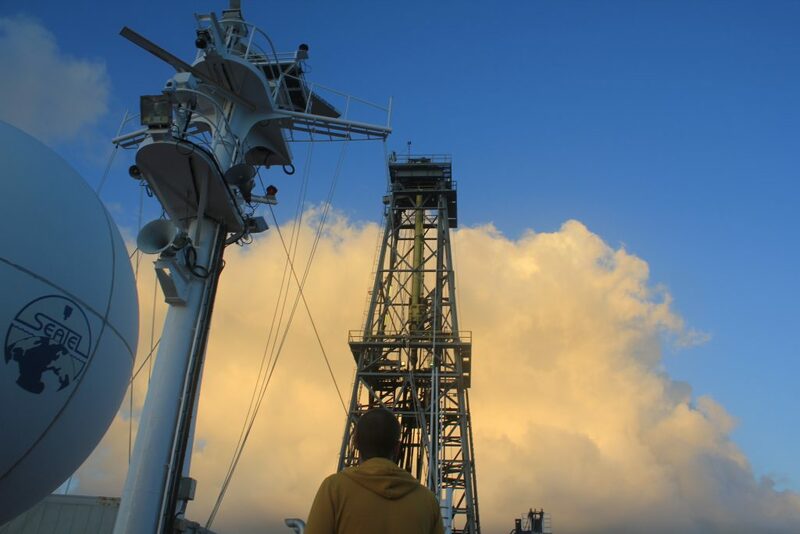 Our goal is to make the sometimes seemingly esoteric science undertaken by IODP more accessible, and hopefully more relevant, to wider audiences. Do you have specific questions about our Expedition that you’d like us to answer? Suggestions for how to connect our science with other topics and fields of interest? Feel free to reach out to us on our website, or on our Facebook or Twitter pages.